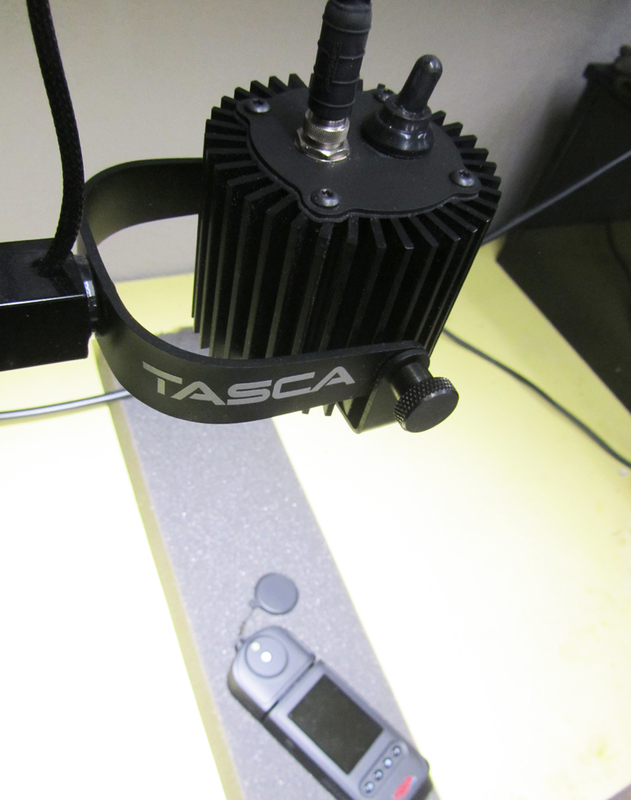 During the development of Tasca, finding a flicker meter was a little tough, so I improvised an oscilloscope and photocell rig that allowed me to see light output modulation. Using this we experimented and tested combinations of LEDs, drivers, and power supplies. I felt the end result was pretty much spot on, as near to the zero flicker from battery operated sources or even daylight as one could get. Yet, until recently, I had not been able to verify this was the case. 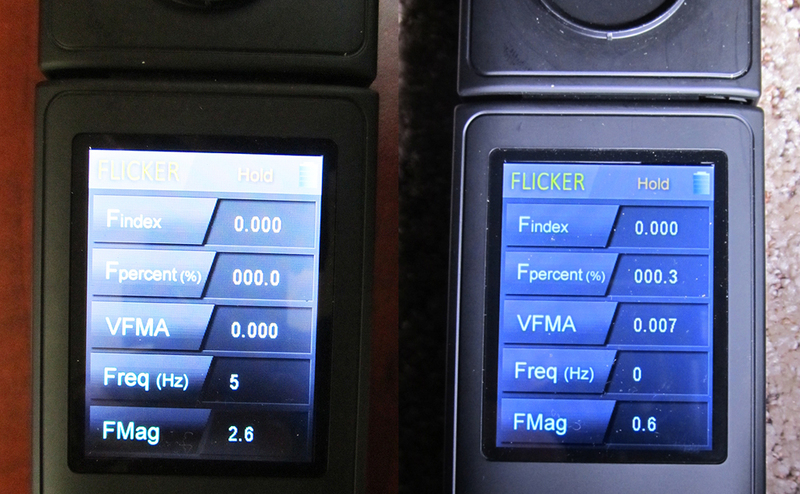 Enter the UPRtek MF250N flicker meter (review to follow soon). With this, I have finally been able to see how well the Tasca head was performing. I was thrilled with what we found. Daylight and the DC LED ideal models to set a high bar. 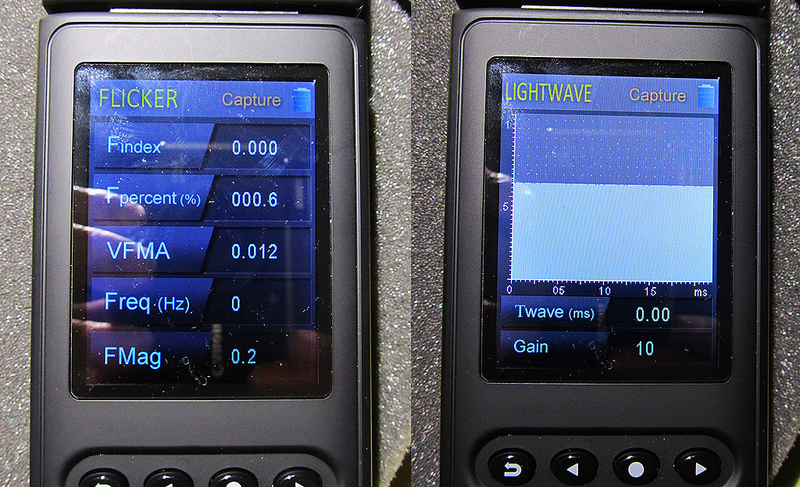 Daylight (left) and a DC powered LED (right) were set up as our performance target. They simply don’t flicker, so using the meter, I tested these bench marks. Note that small aberrations in readings (like the frequency of 5 for daylight along with a frequency magnitude of 2.6, or the frequency magnitude of 0.6 with no frequency for DC connected LED), are just that. This happens in all metering to some degree, and are within a margin of error for this meter system. The results for the Tasca head are exactly what I’d expected. Their simply is no flicker. While the meter indicates a Flicker percent of 000.6, and a magnitude of 0.2, there is no frequency component, so these are irrelevant. I was thrilled with the results. It meant several things. 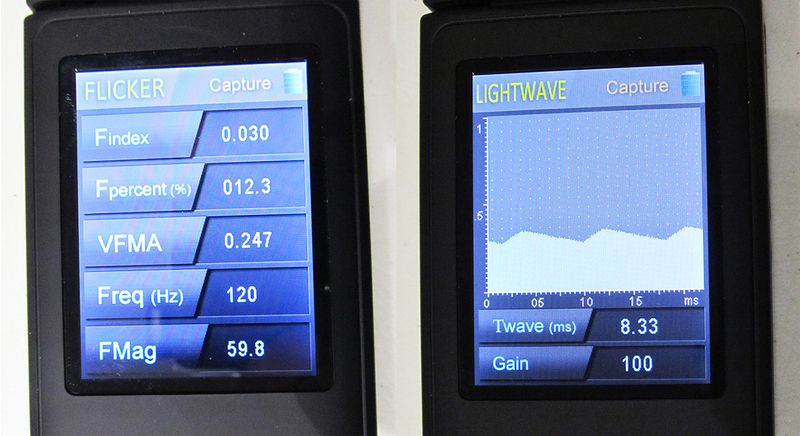 First, these metered results were essentially identical to what we got with our shop made flicker measuring rig. Second, the product itself is simply doing exactly what I intended it to do, which is truly satisfying. This is a T12 on magnetic ballasts. The beast that started the flicker discussion. 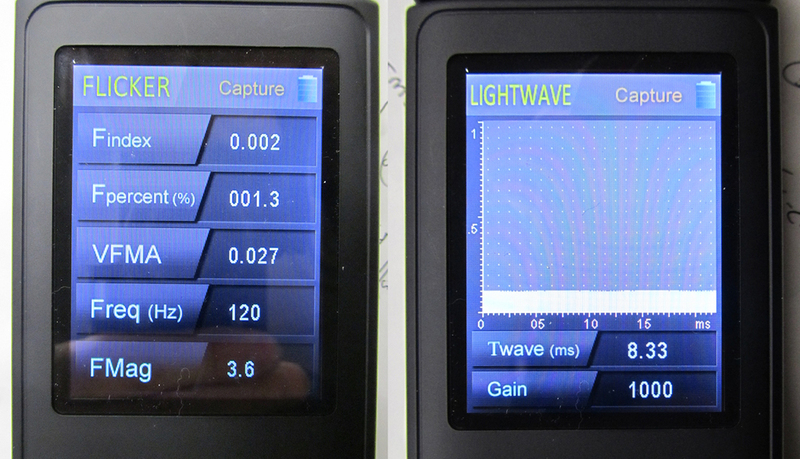 The wave form shows obvious modulation, supported by poor results in both flicker % and index. 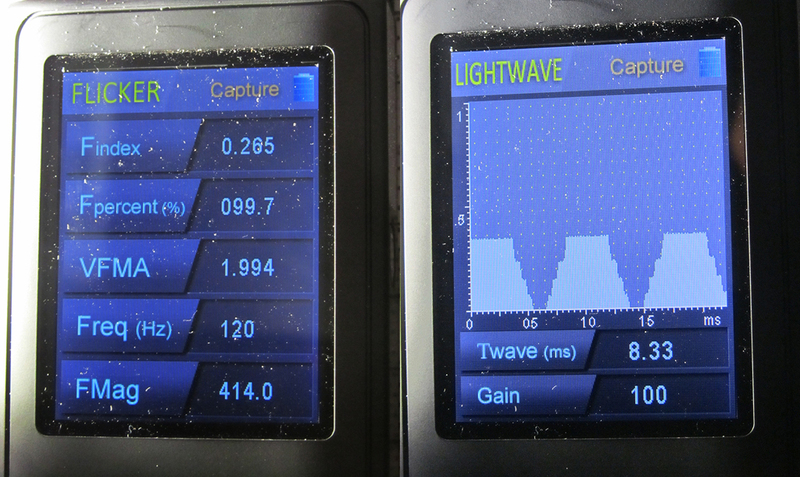 The height of the wave shape is evident in the VFMA (Flicker Amplitude) and FMag (Magnitude) readings as well. LEDs connected to AC circuits are not a good thing, even this one using additional bits to supposedly reduce flicker. 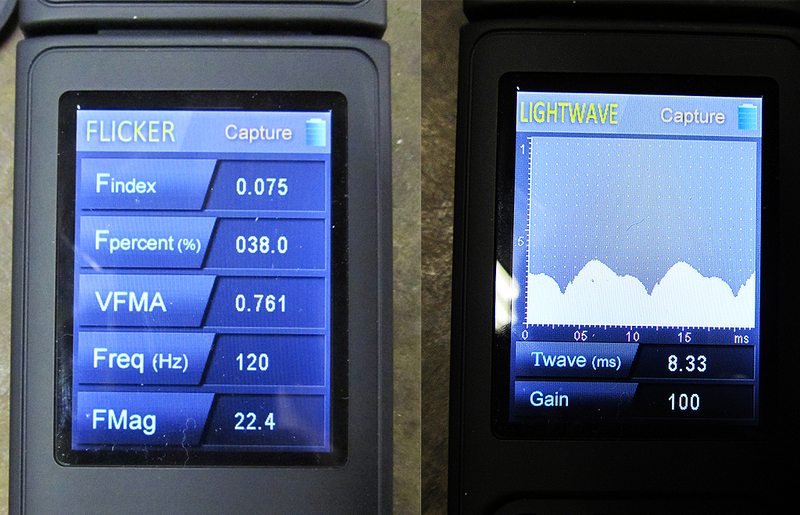 The results are the highest flicker % and Flicker index of any source in this comparison, in every measure. This is an AC connected LED with big capacitors added in an attempt to fill the gaps. While it reduces the flicker index to some degree, it has no effect on the flicker %, while the odd wave form creates strange results in other areas. This is a retrofit LED. In general, it does not do a bad job reducing flicker, but is obviously playing a trade off game between cost of driver/power supply and output modulation. This T8 fluorescent with electronic ballast is doing a nice job of controlling modulation, with a very small, impossible to see modulation at the native 120Hz. I recognize that there is a grand debate about flicker and whether or not it is an issue at all. Most of the argument against setting strict flicker standards are put forth by those who seek to market low cost LED products that exhibit flicker of 120Hz, whether that be AC LED product based or just low end power supply components. There is no case to be made that flicker is a positive component of lighting, and extensive past industry experience with T12 fluorescent lamps on magnetic ballasts, and HID sources used in commercial application, is what started and fueled the discussion of 120Hz flicker as an issue. Complaints of visible modulation, headache, migraine, etc.. have been studied and found to be corollary to the existence of flicker. Further, studies have proven a connection between flicker below 200Hz having a negative effect on visual performance in schools. While it is true that organizations like NEMA, IES, CIE, and IEEE have yet to come to an agreement as to what defines bad flicker vs. acceptable flicker, this lack of agreement does not indicate there is no issue. In fact, that these organizations have and continue to discuss this issue, against the steady pressure of manufacturers to set it aside, is an indication that there is a very real issue with flicker, that will eventually be resolved – albeit with some compromise included to placate manufacturers involved in standards proceedings. As a member of the IEEE 1789 committee on the topic of the risks of flicker, I can attest to the depth in which this topic has been investigated and discussed, and bear witness to the hundreds of papers written on it and its effects on vision and human physiology. In my own opinion and recommendations to others, I ask one question – If there are sources and products available that exhibit no flicker, or flicker of such character as to not be an issue (such as T8 and T5 fluorescent on electronic ballasts, and quality LED driven products), what is the reasoning for continuing to accept any products that flicker in the zone of 100Hz to 200Hz, with a flicker amplitude >0.3 (minimal modulation depth) at all? Any level that exceeds, approaches or shares flicker characteristics with the T12 fluorescent lamp on magnetic ballasts, in my opinion, should be considered unacceptable for any use, regardless of arguments over cost saving. This includes any continued use of magnetic ballasted HID sources for interior illumination and AC connected LEDs (with no flicker mitigation) – as these are all far worse than the T12 lamp. While in ambient lighting, a weak case might be made that flicker may be of small consequence – I propose that in task illumination, where visual acuity is critical, focus is the goal, and high illuminance and task demands increase the risk of stress, there is no rational case to be made to accept flicker of any level. For this reason, I have focused my attention and effort on creating lighting systems (and sources for components) that present either no flicker at all, or characteristics, such as high frequency operation (>2,000Hz), very low modulation depth (amplitude of <0.3%), low flicker index (<0.05), at all light level settings or dim states. I believe these to be reasonable and attainable standards, and have found no reason to accept poorer performance. Thank you for this post, and being a beacon of light for health in the IEEE. I’m someone that has negative heath effects from flicker (headaches, eye fatigue/fatigue, concentration etc). I’m in an office that has T8’s on magnetic ballasts, basically not much different to T12’s. It’s also worse for me as I’m in a country with 50Hz AC so 50-100Hz flicker. Problem is when I complain about the “flicker” and health issues, the response from the maintenance/facilities and HR is that they replace any visible flickering tubes, and my “invisible” flicker is not there concern, even when using my iPhone to capture the flicker on video. I’ve read many health related studies, passed these on. But because it’s not a “law” or it’s not governed it’s OK to ignore me, as I can’t get medical support to backup my claims. There is no definable medical condition for being sensitive to subliminal flicker. Just get told to wear sunglasses/ take pain medication or I’m not suited to office work. I’ve suffered my whole life school to work..Now with crappy cheap LED’s, it’s getting worse not better. I can live quite happy under T8/5 electronic ballasts, and tested this whilst in another office that has these. Do you have any suggestions how us sufferers can get action, in my case all I’m asking for is to change the ballasts which will save money also, but as it requires up front capex, still no action. Any suggestions would be appreciated.The problem is the world is still full of offices and classrooms full of flicker, and no one seems to have any power to change this? I whole heartedly agree with your sentiment that it’s just not appropriate to accept flicker, but how do we get some real world action on this in changing what is already installed? There is no simple solution. Since it is difficult to get some people to listen, the onus of proof is on those effected to make the case. This starts with creating a case based on research already in place, white papers on the topic, etc.. Further, for those with severe response to flicker, having a method for demonstrating when flicker exists is important to show those who are less inclined to see its existence. This can be as simple as a flicker demonstration tool like our flicker machine, or a more sophisticated flicker measurement meter, like that offered by UPRTek. Armed with a summary report with cited objective references, and empirical data on the environmental conditions, you can start the fight. Another approach is to simply ask that the lights in your work area be removed or shut off, and you provide your own task and ambient lights to serve your personal needs. I’ve done this in every office I have ever worked in for 30 years, and eliminates the larger expense on employers to refit entire areas to suit what they perceive is one person’s special needs. I realize this does not solve the issue in a classroom or other common spaces, but it at least provides a refuge for office workers, or even factory task workers, for the majority of the day. Another approach is to organize a test of reading performance under two light sources. 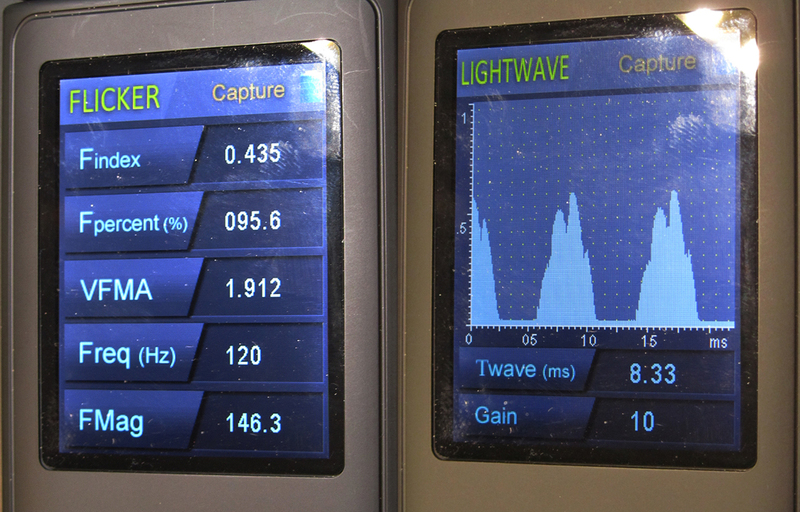 One flickering (T8 magnetic), and one not flickering (T8 high frequency electronic). Use a technically complex text that has numbers and facts to be memorized, and establish a time for finishing the reading under each light. It has been shown that flickering lights reduces reading comprehension and speed. Show superiors that their flickering lights are costing them in errors made, and task performance, plus the cost of energy involved with obsolete sources, and you might get someone to listen. There are also white paper studies to back this up. Otherwise, I am afraid that there is little movement today to create any legal limits to flicker, so those who suffer its effects are being left with no support. I am not seeing any real movement toward resolution of this, as the financial interests of those who make flickering product at higher margins are not backing any play to reduce it. The codes and standards are simply limited to the 100Hz and 120Hz flicker base as that avoids the severe reaction and larger population response to low frequencies. Even then, decorative lights, like cheap Christmas strings and strip lighting are often flickering at 50Hz and 60Hz. I am sorry to say the lighting community is not pressing the case any harder than it is, while pressing ahead with energy saving retrofits that, as you noted, make the situation worse, often by replacing low flicker incandescent/halogen sources with flickering LEDs, or even retrofit LED tube lights that flicker more than the fluorescent lamps they replace. There is a lot to be done here, which is why I have taken the stance that no flicker is acceptable – at the cost of customers I once had who produce flickering products that now see me as an antagonist to their self interest.. oh well. Unfortunately for me I have a job role that requires I’m available to be present in the entire office space, so a safe sanctuary is nice and helps recover, but it’s not enough. I’m going to pursue the avenue of what is “flicker”, many health and safety authorities stipulate that flicker is a hazard, yet they only suggest to replace faulty tubes etc. However the definition of flicker here is the commonly accepted I see it type flicker. However the proof of scientific flicker meters, and the suggestion that some people do in fact “see” 50Hz peripheral flicker, suggests magnetic ballasts are faulty when flicker is present, particularly when individuals suggest that the flicker that is present they can in fact feel it’s effects. Proof of it’s existence is measurable physically, via a meter, and it’s felt reaction surely is grounds for proving Flicker exists and manifests unhealthy reactions. The fact I can take a video of magnetic ballast flicker on my iPhone, is also a physical proof of it’s existence. Therefore replacing the ballast is the appropriate control. Well it’s a long shot. Plus the push for the realization that electronic has a good ROI, and presents other health possibilities in return. Also the flicker on first turning on is horrendous, it’s physically present, and I can’t not have to switch these things on each day, instant headache! This leaves individual sufferers needing to fight their individual corner as you suggest. Well done on taking a stance on flicker, I applaud you for that.